When going to market with any search you need to be armed with some background and expertise on how to find the best talent, but you also learn some things along the way. These insights help refine the search goals and expectations, which provide direction for tactics within the search itself, but also help develop and align your long-term talent strategies for future success. 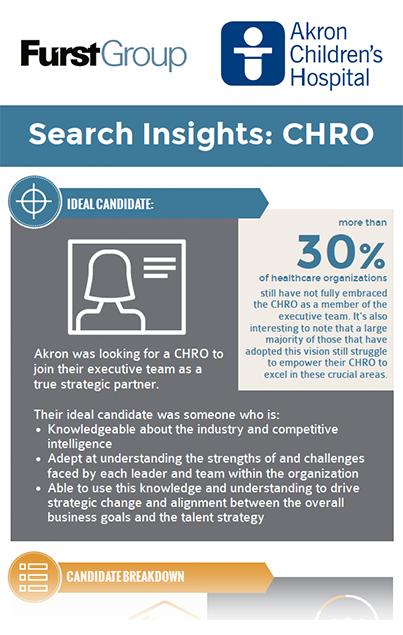 Akron’s definition of an ideal CHRO is not unique, but in our experience more than 30% of healthcare organizations still have not adopted this vision of executive team effectiveness. It’s also interesting to note that a large majority of those that have adopted this vision still struggle to fully empower their CHRO to excel in these crucial areas.